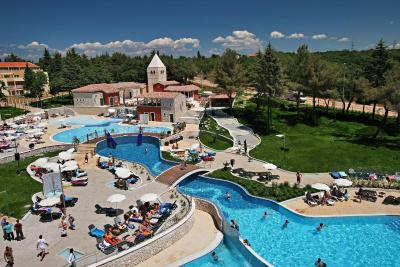 Lock in a great price for Hotel Sol Garden Istra for Plava Laguna – rated 8.2 by recent guests! Free parking, nice size bed, nice stuff, good size of the room. Big balcony. 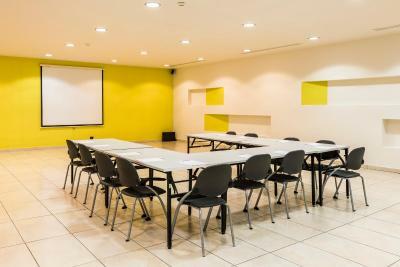 The location, the double room, nearby facilities and nice personal. I liked the location a lot! Rooms were clear. Staff was polite. Many thanks! 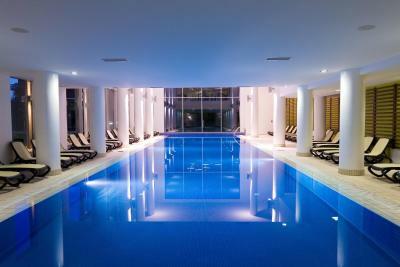 The outside pool, beautiful garden, lovely reception and entrance hall. 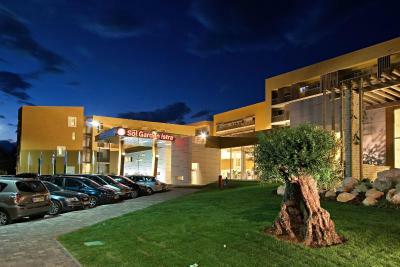 Hotel is situated in the peaceful part of the city, a lot of greenery all around. Free parking and safe bike storage are assured. Great for family stay - connected rooms are big, beds like at home. Many pools and also some water slides. Food suitable for children and varied enough. Good parking solution and beach was only in a walking distance. Rooms are very nice and comfortable. Taking Park view room is not really worth paying extra money. Food was really good and plentiful. Waiter Marinko was very proffessional and made our stay more comfortable I give my praise for him to the management also to lady Sanela at Club 4 who was very patient with our little one. Swimming pools are great. Clean and well maintained. Internal pool was open and we could use it when weather was bad. Lunch food was also very tasty at the hotel restaurant and not too expensive so this fills the HB to FB nicely. Nice detail was that I have received a bottle of sparkly wine for my birthday from hotel management. It was fun and memorable and there were quite a few activities to do there for the kids. 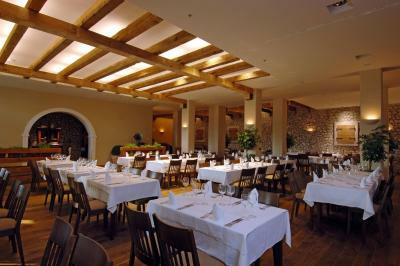 The food was nice and the rooms were comfortable and cosy. Hotel is excellent! Pools also. Receptionist are very polite and friendly. 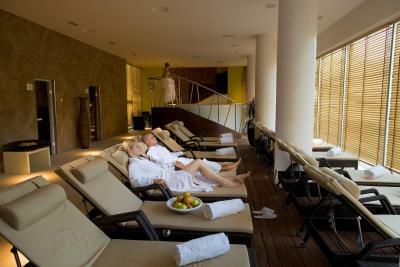 The hotel is situated norh of Umag, about 20 minutes walk, or by tourist train. The hotel is big, so you must count with many customers during season, however, the staff (which is very very kind and friendly, from reception to maids) was very able to face the mass of people during breakfast nor dinner. Inside pool is good, outside also. PLENTY of sport activities to do, the entire area of umag is perfect for every kind of sport you may like...biking, walking, running etc. 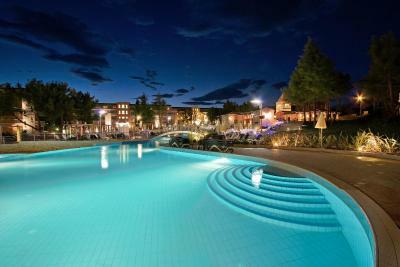 Hotel Sol Garden Istra for Plava Laguna This rating is a reflection of how the property compares to the industry standard when it comes to price, facilities and services available. It's based on a self-evaluation by the property. Use this rating to help choose your stay! 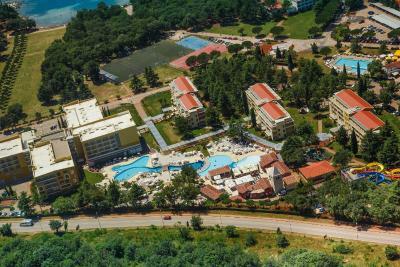 One of our top picks in Umag.The Sol Garden Istra is surrounded by pine and oak trees and only 800 feet from the sea in the Katoro tourist resort, near Umag. 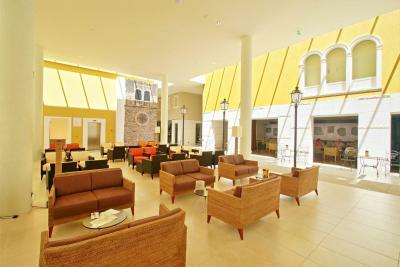 All rooms have air conditioning and a balcony. 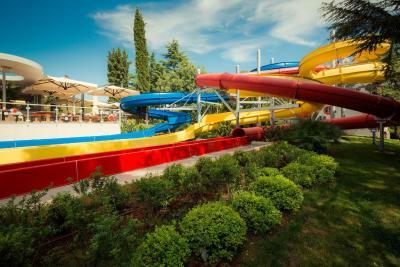 The hotel offers an Aqua Park with numerous pools and the Sports Art center where you can play basketball, handball and many other sports, as well as taking part in day and evening entertainment. 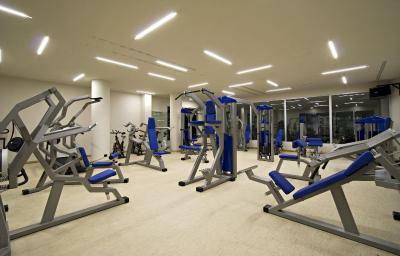 Guests can relax in the wellness center, with sauna, indoor pool and relaxation room. 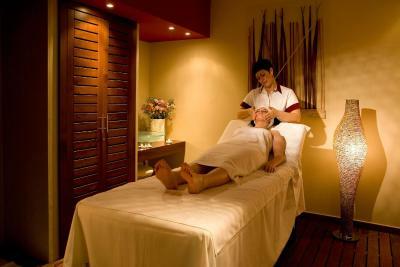 A number of beauty and massage treatments are also available. 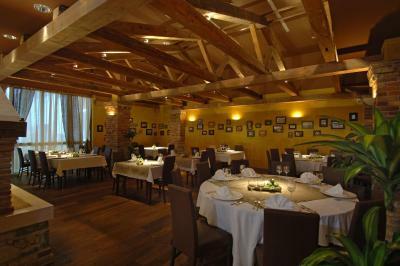 Istarska Taverna offers Mediterranean specialties à la carte and there are 3 restaurants with show cooking and several snack bars. Free ice cream, refreshments and snacks are available for kids from 5 up to 12 years of age at a given time during the day in the period from 15th of May until 15th of September. 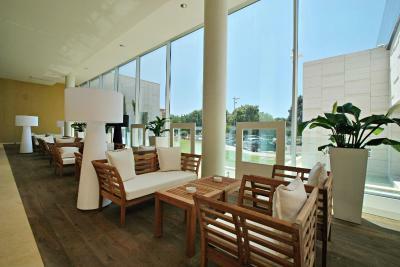 Sol Garden Istra offers possibility to reserve an exclusive parking place right in front of the hotel at a surcharge. 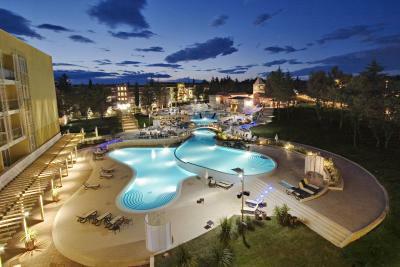 When would you like to stay at Hotel Sol Garden Istra for Plava Laguna? 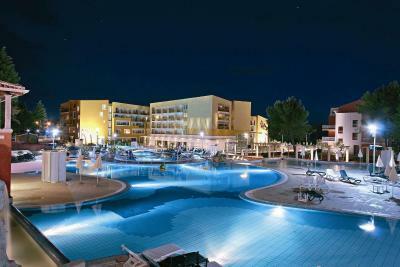 Spacious and modern rooms with a flat-screen TV, bathroom with a bath and large balcony overlooking the pool. Featuring a furnished balcony, this room also consists of a flat-screen TV and a bathroom with a bath. Spacious and modern rooms on the sea side with a large balcony. Very spacious suites featuring a large balcony overlooking the park. The lounge area consists of a flat-screen TV, while the bathroom is fitted with a bath. This air-conditioned room consists of two interconnected rooms and offers a balcony, a mini-bar and satellite TV. A safe is available as well. This air-conditioned room consists of two interconnected rooms and offers a balcony with a view of the park, a mini-bar and satellite TV. A safe is available as well. 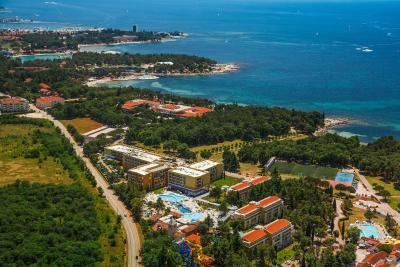 This Family hotel in Umag uniquely couples contemporary design with motifs of authentic Istrian history, creating a hotel of unmatched distinction. 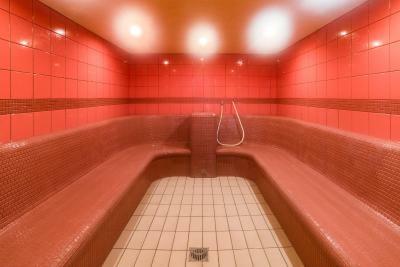 With specialised amenities for bicyclists, this hotel is a top bike hotel in Croatia. 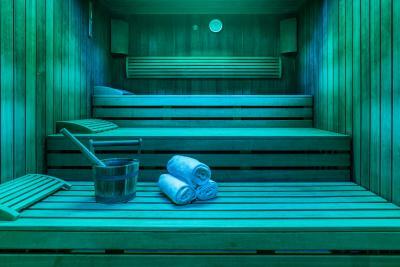 The hotel also offers fun and activities for the whole family: an outdoor water park, wellness centre "The Body Holiday" and access to the Sport Art centre, which is complete with sports grounds for football, handball and basketball. 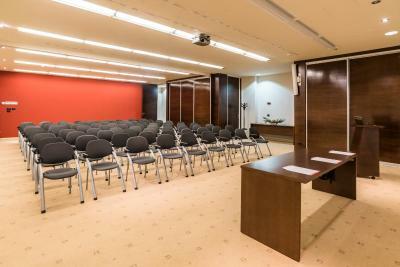 Also equipped with a business centre and located just 200 meters from the Adriatic Sea, hotel Sol Garden Istra is the perfect choice for an unforgettable vacation. 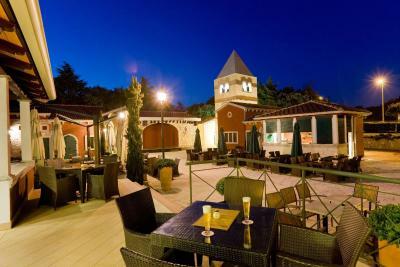 House Rules Hotel Sol Garden Istra for Plava Laguna takes special requests – add in the next step! Hotel Sol Garden Istra for Plava Laguna accepts these cards and reserves the right to temporarily hold an amount prior to arrival. 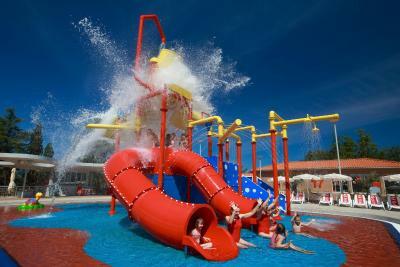 Please note that the Aqua Park is open from 15th of June until 15th of September. Please note that free ice cream, refreshments and snacks are available for kids from 5 up to 12 years of age at a given time during the day in the period from 15th of May until 15th of September. Breakfast buffet was a bit overcrowded. 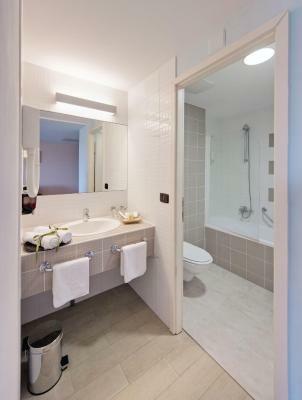 Nice big rooms with large modern bathroom. Poor choice of food, 4 star hotel should have better choice of food. Pool is too small for such a big hotel. Toilets and showers must be restored, they are really in bad condition. The hotel needs renovation: worn out equipment in the bathroom, on the balcony. The food was not as good as it should be in the 4* hotel: the choice of bread in the morning was not sufficient and the desserts for dinner were really bad (always some lousy pudding, tasteless cakes or plain ice cream from big pots). I would really appreciate the choice of eating meals out-there is a small terrace in front of the hotel, but it was not opened and the tables were not prepared. The dining rooms were hot and loud (in September), air conditioning would be appreciated. Breakfast and dinners were overcrowded even if you come after peak hour and it was a bit worm in the dining room. Bit more control on swimming pools of who does what. People were spraying with spray guns, playing ball and jumping into pool without any control. The check-in process was terrible. Initially we were not given the bed type we reserved. Took hours for the mess to be fixed. Initially we were told that our bed size type room was completely sold out but later we were offered the room type bed we booked for an extra charge per night which made no sense. Why would someone have to pay the extra charge if already booked the king size bed? The receptionist certainly could not give us a reasonable answer for this question (we were given a double bed without any warning about the change in room type until we walked into the room and saw for ourselves; then when we went back and asked, we were told that all king size beds were sold out at the property which was not true). Eventually we ended calling Booking.com as we got no resolution from the hotel staff and Booking.com resolved the issue for us. We ended up getting the room type we booked without paying the extra charge because of Booking.com. Booking.com has a great staff who is willing to go above and beyond to ensure you get what you paid for. However we ended up staying only one night instead of five nights at this hotel due to a poor customer service. 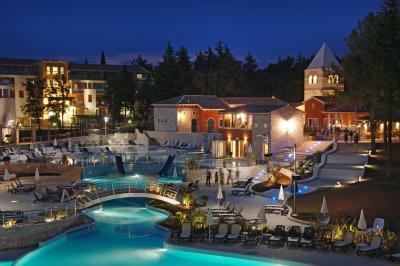 We ended booking a different hotel for our Croatian vacation. The worst part is that we were traveling for 20 hours and were looking forward to some sleep and relaxation when we arrived at this hotel. To make the matter even worse, no one from the hotel staff apologied to us for the inconvenience until the following day when we checked-out. The room was smelly and unclean, the bathrobes were dirty. We were given a new room due to the smell. The new room was for persons with disability and didn't have a working shower (there was no water). In the early morning all the deckchairs were already reserved with towels without any people around. 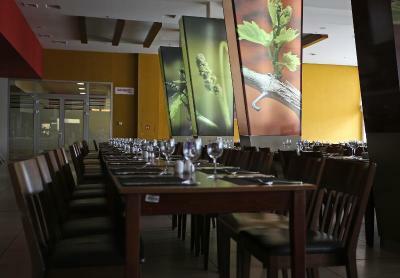 The selection of food in the restaurant was very poor and beyond the level of a four star hotel. It was slightly hard to get good parking. The pictures of the property are not reflecting the reality. Maybe these pictures were shot at least 10 years ago. The furniture is already old. Breakfast is average. Low choice availability for fruits during breakfast. Very expensive for the quality provided.